When you are creating your WordPress website there are a few no-no’s that you can avoid. In some cases these things may not create immediate impact, but in the long run they can make you lose money without even noticing. The major thing I’m going to emphasize is website speed. Ever since Google started using website speed as an SEO factor, I became obsessed with it. It’s one of the biggest issues I notice every time somebody sends us a message and wants to work with us. If you have not checked your website in every browser, you may already be in trouble. Sometimes the issues are small like some misalignment of the content or a background color that doesn’t load properly. But many times over the issue can be bigger, like your contact form not working or part of the content is missing. Especially in Internet Explorer, things can go wrong pretty quickly. Check your website in every browser possible, like Internet Explorer/Edge, Firefox, Chrome and Safari. You don’t have to install every browser to test it out. There are several tools, some of them are free or others have a free trial that are great for your testing purposes. In the worst case scenario you could just ask friends for help or share your website on social media websites and ask people if your website is working properly. This one is the continuation of the previous point. Recently I was on the go when I started browsing my phone, looking for restaurants in the area I was in. I landed on a website and as soon as I started looking at its content all of a sudden a popup overlay was blocking me from reading it. Since I couldn’t close it, I had to go back to the Google results and move on to the next one on the list. Small things like that can make you lose visitors and customers. Make sure you test on different mobile devices. Some of the tools I mentioned above have the option to test it out. Also, ask your friends. Many times over testing things out in the wild using somebody’s phone is a lot better, especially in public places where connectivity speed varies drastically. I’m actually guilty of this sometimes. Many times over you want to add something new to your website. Whether is a pricing table, a form, or a social media link, it doesn’t what it is, the quickest way is to go to the WordPress plugin directory and install a plugin that can solve the problem pretty quickly. The issue with this is that when you setup 15 plugins, chances are that many of them will load external files and sometimes those files and the plugins are not well optimized. So make sure the plugin has good reviews and it doesn’t affect your website speed or usability. Browse around your website pages after you install a plugin, you never know. Images are pretty; they enhance your website design and help you provide the visitor with a pleasant user experience. The problem is that many people upload too many pictures without worrying about the amount of pictures they are using. Also they upload pictures without checking the size and if they are optimized. This can impact your website performance especially in mobile devices, where like I said before, the connections are slower. If you are using a content slider, avoid putting too many slides in it. Whether you are just rotating pictures or having animations on it, just avoid using too many. I’m not a big fan of content sliders, they tend to slow your website down and distract your visitors. When I use them for my websites, I try only using one slide with a call to action. There are some exceptions like news websites where you can use them to rotate news, but make sure you don’t have too many slides and that you are optimizing your images before you use them. This is a simple but costly mistake. If you change the URLs of the pages or post of your website after you published them, you can trigger a bunch of errors in the Google webmaster tools. And if you have posted them in social media platforns, people click on a link and ,since you have changed the URL, they are going to be redirected to a 404 missing page error. Here’s how you can avoid this problem. Obviously make sure you have the right URL before publishing it, but if you do change the URL, you can use something called 301 redirects. 301 redirects will redirect the old URL to the new URL and tell the search engines that the move is permanently. (Just replace to the right URLs). These plugins don’t affect the speed of your website. Child themes are themes that use a regular theme as the base template. That way you can perform changes on the child theme without altering the main template. This is good because most themes have regular updates. If you made changes to the main template, you will lose them in each update. Not only is this annoying, it can also be costly if you are paying somebody to do the changes every time an update is released. Usually any good developer will use them or make the suggestion for you to use them yourself. Using a bad hosting company can be the biggest problem you can possibly have. There are a few companies that sell really cheap hosting and I mean cheap not when it comes to the price, but in the servicse provided. Sometimes your website doesn’t load fast, or it becomes unresponsive or it can’t handle more than a handful of visitors at the same time. That’s why we we personally stopped recommending Go Daddy. We still have to deal with them while managing client’s websites, but it’s really painful to work with them when people are paying for their cheapest available service. It can slow down the website to a point of making it unresponsive or the website does not even load at all to begin with. This happens randomly, so you never know when it will fail you. That’s one of the reasons we started providing hosting services for our clients. This way we are in control of things and if they are not running well we can work on improving them right away, instead of explaining to people why it pays of to pay more for a different server than the one they are currently using. If you are not creating backups periodically, you are going to have a bad time. If you are relying on your hosting company to create backups of your website, you are going to have bad time. If you are backing up your website in the same server you are hosting it, you are going to have a bad time. Jokes aside, the other day a friend told me how his website was down for a month because the hosting company was having problems and he didn’t have a recent copy of his website. The website was with user generated content and there were thousands of people visiting the website daily. By the time the hosting company solved the problem, his website was having few hundred visits a day only, instead of thousands views as before the incident. Although he will hopefully get back to the top of the Google rankings, the impact on user experience was huge. If he had created a copy of his website, he could have easily purchased another hosting account in another company and setup his website the same day as soon as the problem started and the impact could have been reduced to a minimum. This one is obvious. If you don’t do your minimum security due diligence, you are exposing your website. Getting a WordPress website hacked is more common than you might think. Although is impossible to have a website 100% hacker proof, you can always cover the basics and at least protect yourself from hacker wannabees that only exploit basic problems. Most of the WordPress updates are about bugs fixes and security. If you are ignoring them, you are putting your website at risk. Update your website periodically to avoid headaches in the future. Don’t forget to create backups before doing updates, if something goes wrong you can always go back to the older version. Some of these problems can be solved quite easily, others require more work. Don’t let these things diminish your investment, and put some time on these common problems to solve them. If you don’t know how to do this, subscribe to our newsletter and we will share tips and tutorials with you. If you prefer for somebody else to do it for you, (shameless plug ;) ) just contact us and we will be happy to help you! I hope you like this post. 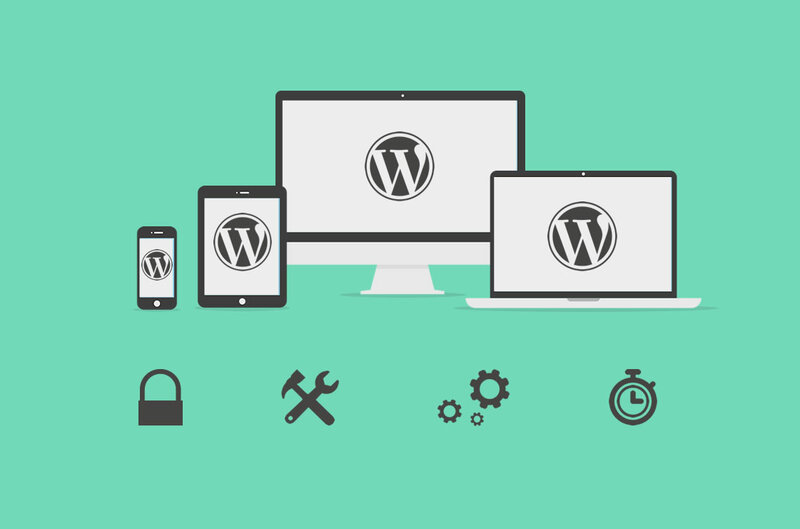 Avoid these common WordPress mistakes and save yourself some self-inflicted misery. If you have other mistakes people should avoid, leave us a comment below. We love to hear from you!